You are currently browsing the tag archive for the ‘frugality’ tag. This is why I have come back to blogging. I’ve been away from here for more than a year now. In that time, I have tried to grow my birthing business locally. I have supported my husband in opening his own tattoo shop. I have grown and given birth to another daughter (HBA2C) and gotten her through her first 4 months. I have been schooling my oldest -Deladis – through 2nd grade. I have been taking classes with Stephanie Dawn to become a Sacred Birth counselor. Aside from homeschooling and giving birth, I have done a lot of things that were focused on growing us from outside of our home. Growing us into a better financial stability. I dared to dream of us living this life of radical separation from what is considered “mainstream” all the while having the income to support us repairing and expanding the cabin, getting a newer vehicle, affording health insurance for John and myself, and travelling with our girls. I also still see myself as being able to contribute to the bettering of my community, region, state, and country through various efforts. It isn’t that I shouldn’t continue to dream of us having the income to do those things, or me the ability to be out in my community to make a difference. Some of those things have to be done as my girls will continue to grow up and John and I will continue to grow older. The problem comes with my patience. I thought that if I worked super duper hard, those things would come. The fact is, that working hard isn’t always the key to financial gain or even satisfaction. I’ve found myself disappointed, disconnected (despite Facebook time – LOL), and wondering what all the effort is about. While I have made some pocket change, I haven’t contributed enough to our income to really matter all that much. I enjoy my work so very much, and I feel like it is important work. I know I am going to keep working when opportunities do arise, but what I know now is that those opportunities have to be ones that aren’t a strain to my efforts with my girls and something that consistently takes away time I should spend with my husband. We chose to take a cut in income when we had Deladis. Then, after Ivy was born, we chose to move home. Both of those decisions were made because we felt that my being home was more important than having a lower middle class income and we felt we could more fully express ourselves and parent our children living back where we both began – southeastern, Kentucky. So, what I realize now is that the grass isn’t greener on the other side of the fence, and that statement will never stop being cliche. I won’t quit dreaming of those things that took my focus more to business and social networking, it is just that the path should be revised. I should be patient. Witch: And you, my dear, what an unexpected pleasure. It’s so kind of you to visit me in my loneliness. Dorothy: What are you gonna do with my dog? Give him back to me. Witch: All in good time, my little pretty. All in good time. Dorothy: Oh please give me back my dog. Witch: Certainly, certainly, when you give me those slippers. Dorothy: But the Good Witch of the North told me not to. Witch: Very well. (To her winged-monkey captain) Throw that basket in the river and drown him. Dorothy: No, no. Here, you can have your old slippers but give me back Toto. Witch: That’s a good little girl. I knew you’d see reason. I’ve seen reason. But, as we all know, the witch loses in the end and so will frustration. My work here at home with these girls is radical world change in the making. Creating a lifestyle that presses boundaries, breaks walls, and reinvents the common experience, that is being the change. Every day I am being the change. Some days are better than others. But, each day we should strive for balance. Creator didn’t lead me down this path for naught. What I have recognized is that each and every step is important, and it isn’t always going to be as I envision, nor will it always be in my time frame. It isn’t going to look the same for me as it will others. Each day is new and has its own work. I have life and I have it abundantly. I’m never left without, and to struggle to gain something I haven’t lost in the first place is pointless. So, I’m trading in the pointless for the things that matter. I’m going back to our original vision, while bringing my work full circle into that vision. There are women and families out there that can use my services. They will find me and it will work out in amazing ways. I can do what I so much enjoy – educating and supporting. I don’t need to scroll down Facebook to socialize. I can blog, and get to know people as I had done before here. I can share our experience in full and read about the amazing things others are doing without getting disgusted at the pettiness. (I’m not putting down Facebook. Just looking to re-examine the overuse and wrong use of it.) I can do what I enjoy so much – writing. I’m going to play with my new baby who somehow is almost 5 months old already. I’m going to listen to Deladis read and read to all three of them. We are going to hike. I’m going to cook good food. I can do what I enjoy so much – being a wife and mother. There will be yoga, and reading, decluttering, and music. I can do what I know I will enjoy so much – make my home and body a sacred space. I can. I call it just a day. A real day. I spent time away from the computer. I opened and learned the new pressure canner I bought. We have so many tomatoes, and I know I need to learn to put things up. It’s part of it. Though I have heard the stories of pressure canners blowing people up, I know they must be relatively safe, and it is time I got acquainted. Tomatoes are supposedly easy to put up. I hate reading manuals. I like my reading to have a narrative quality even if non-fiction. I’d much prefer learning my being taught by a breathing being, but time has not allowed me that, and none of my family that lives closer to us cans. I withstood the reading, working through the text step by step, trying to be hands on instead of reading and then doing. I readied 7 quart jars. I knew I’d fill those and have left overs. Yet, when I smashed in the tomatoes as instructed by the manual, I found that I could only fill 4 of those. As soon as the jars were prepared, the girls and I got the best surprise. At my back door, stood my daddy. He had come just in time to be present for my blowing up the house. But, it all went off without a hitch. The best part is my daddy was smiling and seemed at ease. He has a job that carries with it a huge responsibility, and sometimes I wish he could leave it behind. I always remember my happy daddy fondly. Nobody else can be happy like him. When he is happy he can hold the world on his back and go with simple movements, unhindered, laughing. Oh, the laughing. Floaters. I should have poured off the juice I got after packing and put in more tomatoes. 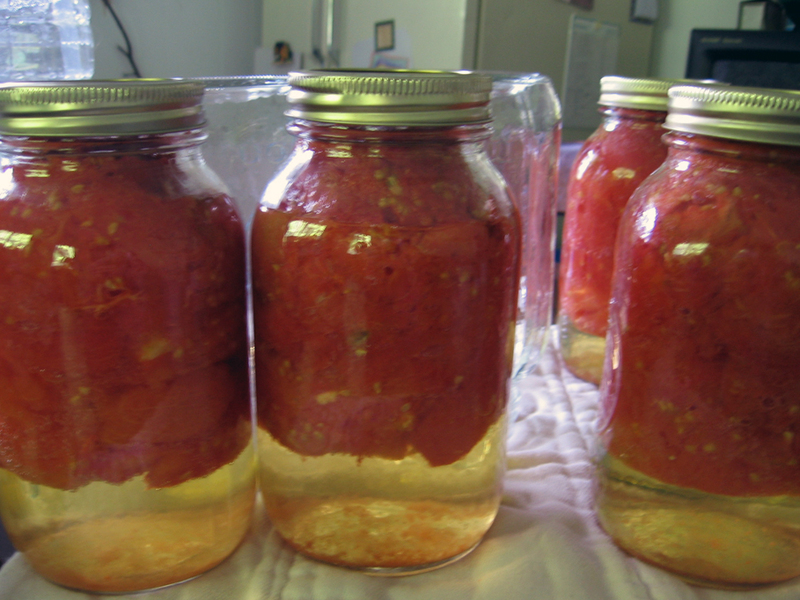 The jars are sealed though, and John’s Mamaw – canner extraordinaire – says they are going to be just fine to eat. 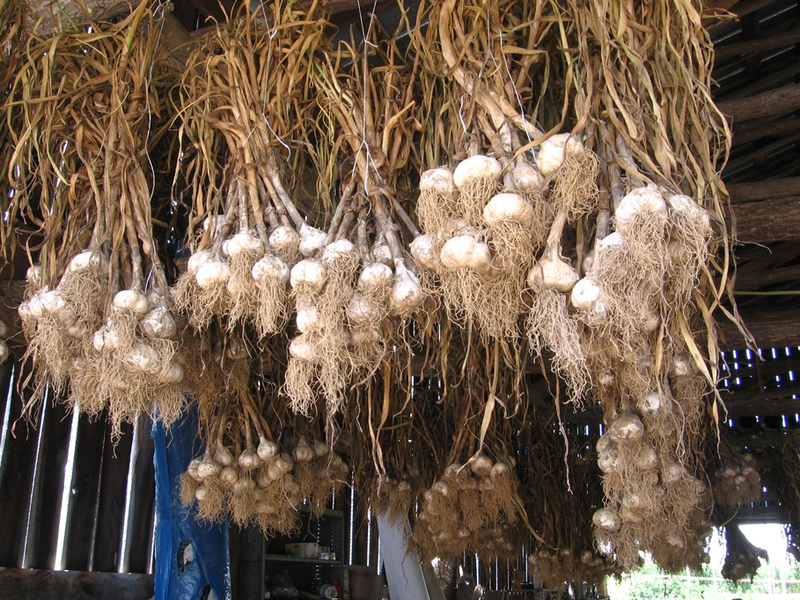 They will be used for soups and sauces this winter. I’m so pleased that the blight didn’t wipe them out this year like our last year’s crop. We are making progress even if baby steps. We’ll eventually walk with few stumbles, then glide. 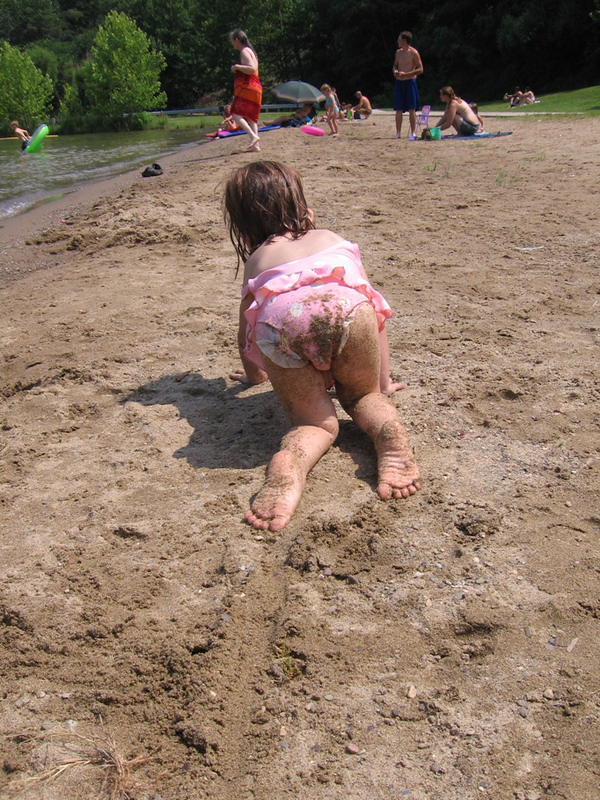 Find more Wordless Wednesday at 5 Minutes for Mom. Yesterday, we went on a trip spearheaded by illustrious Nathan Hall to tour the Abingdon, Virginia Farmer’s Market and the organic farm of Anthony Flaccavento. 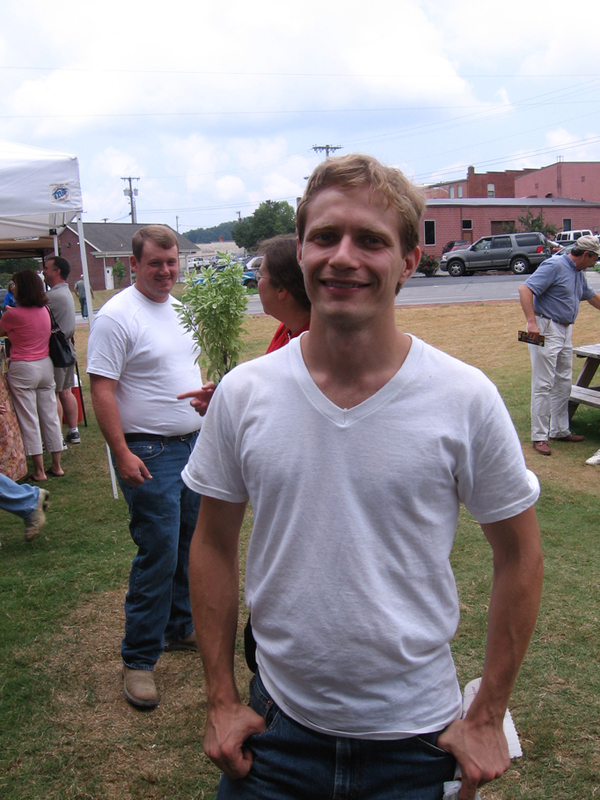 He is the director of Appalachian Sustainable Development, an organization that supports local economy, especially in the form of sustainable agriculture and local eating. 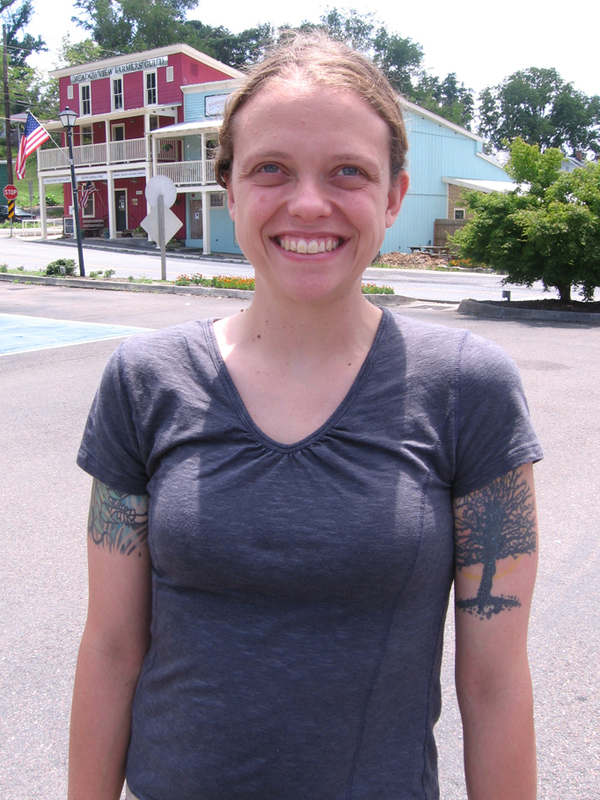 Flaccavento along with others in the area brought about a change in the local economy of a region of Appalachia that is an inspiration to folks living in the coalfields of eastern Kentucky. Opposed to common thought, not all of Appalachia is filled with coal nor is dealing with the results of surface mining (strip mining or mountaintop removal – all other words for it). The questions for us in the coalfields being whether a coal economy is serving us now, or whether it will provide an economy for us in the future. However, many Appalachian towns are looking to rebuild or redevelop their local economies in order to provide opportunities for their citizens and to keep their towns alive and thriving. Some see the answer as being the urbanization of Appalachia, or the move to a more universal American pop culture for all. Others see Appalachia surviving on a more modern version of going back to its roots, and that is where the Haywood’s fall. Hello, this is me, and I will be your tour guide for this adventure showing some of the possibilities for a future for the residents of eastern Kentucky. Not feeling well. Sorry I'm not the picture of health on such a healthy outing. He’s fixing to be a world traveller soon, to learn more about sustainable economies throughout the world. He’ll be leaving the holler on July 22nd and will be blogging about his adventures at There and Back. My greatest wish for the year without him is that John and I can continue to move forward with all the biggness that has come about at The Confluence this year. 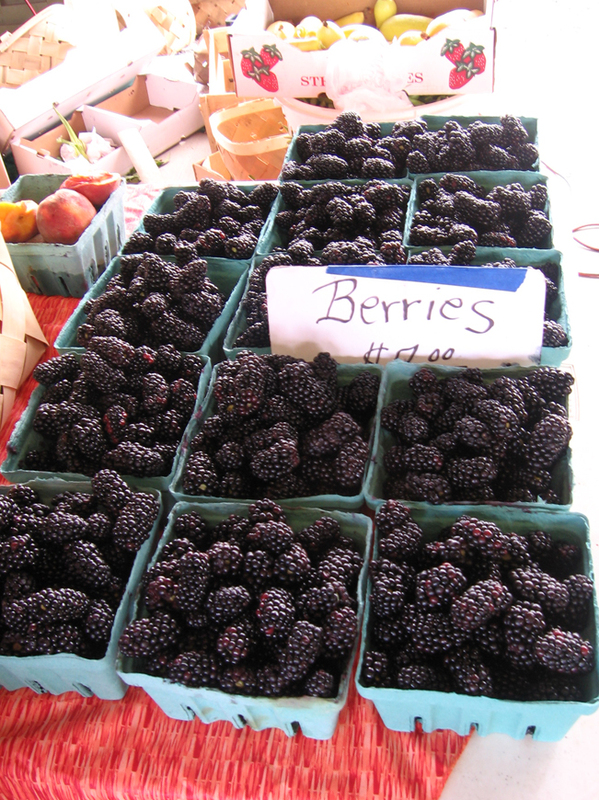 Our first stop in Abingdon was the Farmer’s Market. It was lovely to see such a bustling place in a small town. There were about 60-80 vendors. It warmed my heart to see that many of them were family operations with the children fully involved and content to be there. 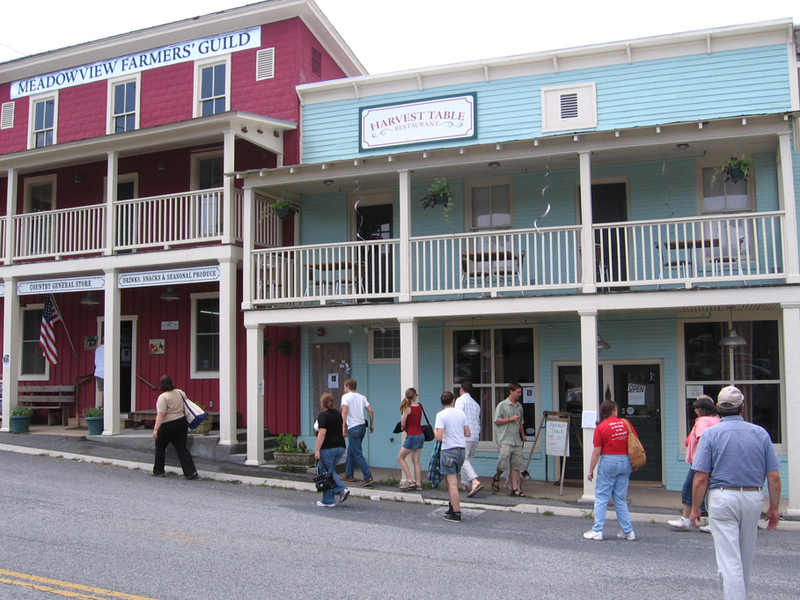 All of these were area farmer’s, merchants, food businesses, and crafts people. One farmer recently said he makes $30,000 a year off of a little more than an acre of veggies. That would be a nice living for our family. The ownership of your own livlihood is a great thing. There was a wide variety of things represented there both organic and conventional. Meeting the needs of yourself and others through special skills. 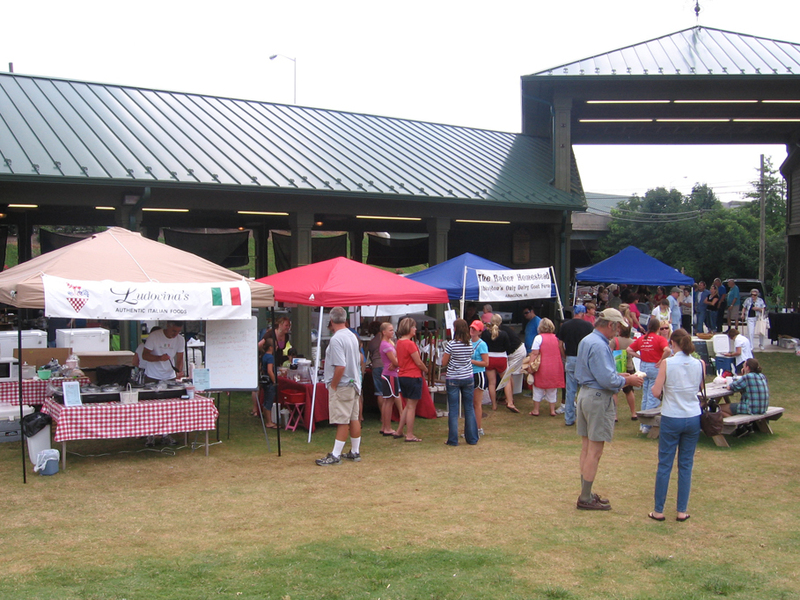 The market is completely ran by the growers/vendors, but is supported by the city. The market is its own entity with its own board. Next, we took a lunch at Harvest’s Table, a restaurant running on the influence of Barbara Kingsolver’s Animal, Vegetable, Miracle. In the foyer, local artists, writers, musicians, and crafts people are supported through the selling of their wares. The food is all local and seasonal. I had the corn and tomato salad with a garnish of fruit and goat cheese. It was so yummy! I didn’t expect it to be when I saw it, but it was. Another interesting thing was all of the soups were chilled for summer – cantaloupe, cucumber, and gazpacho. After eating, we went out to Anthony’s farm. The farm was not tremendously large, but it was much bigger than what we are attempting at this time. 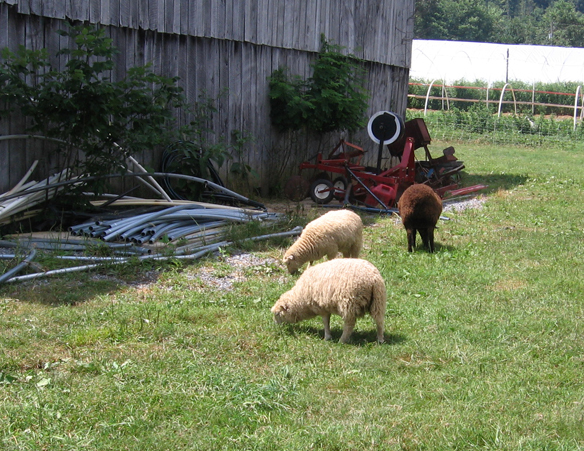 Flaccavento has employees and interns on the farm. 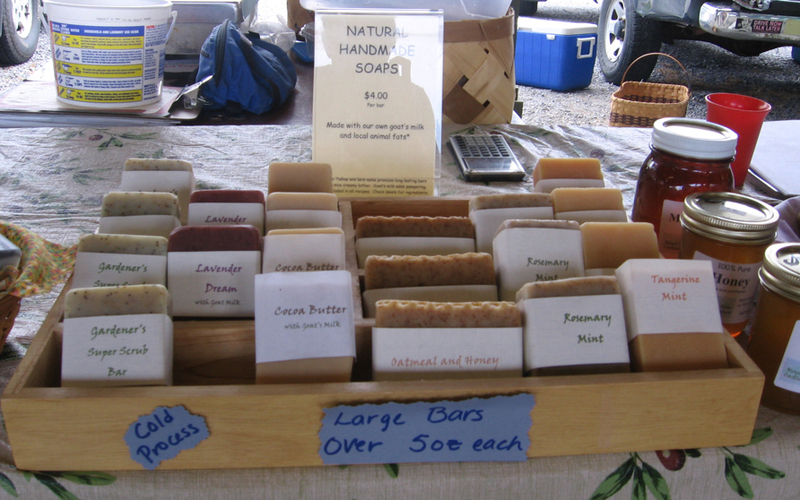 He is certified organic, and uses methods that I have never seen before to achieve store quality results. I’m used to traditional, personal gardening techniques, and it was all a little overwhelming and intimidating. We are definitely not ready for large scale production, but we can work up to producing for more than just our family, learning as we go and following the market. 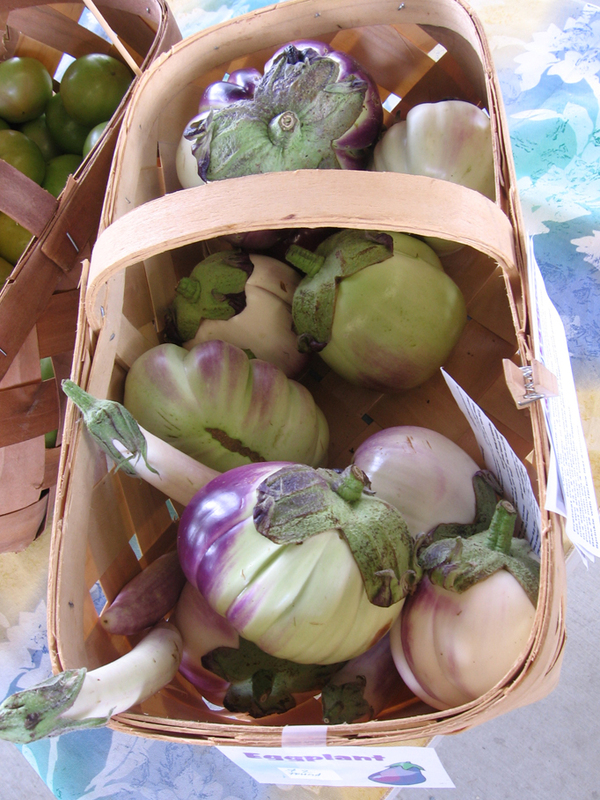 Flaccavento and other farmers sell to area grocery stores, restaurants, and at the Farmer’s Market. They have developed a distribution center called Appalachian Harvest that works with grocery stores and some restaurants. It was most definitely an motivating trip. John says we’ll be old before we see any kind of business result from our work. He insists we must build slowly, and on that point I agree. But, I think with focused work, we can begin to broaden our views sooner rather than later. I have dreams, and a lot of the time they leave me pining for the grass is greener rigormoroar. I see us working side by side on something that brings us even more together. Making our living through our own two hands, enjoying the land, and using our talents in a more relaxed way. Creating something to pass on to our girls. I try to live in the present. I try. It has been quite awhile since I have written anything about our efforts with the homestead. The Confluence (the name of our homestead, homeschool, and educational organization) has grown since last year. Instead of the one garden plot that we had next to the cabin last year, we kept it and added two more down by the barn. The two new plots get full sun, so our corn, tomatoes, peppers, berry bushes, watermelons, peas, broccoli, cabbage, onions, swiss chard, and spinach is there. Here at the cabin plot, I have put in the potatoes, carrots, zucchini, squash, cucumbers, cilantro, basil, and dill. We still have some more tomatoes, lettuce, lavender, pumpkins, several bean varities, and sunflowers to plant. I haven’t decided exactly where they will go. They will be in the ground either this evening or tomorrow. However, I will not be planting while the sun pours down across my back. My shoulders and forehead are sunburned and I have the hot chills. 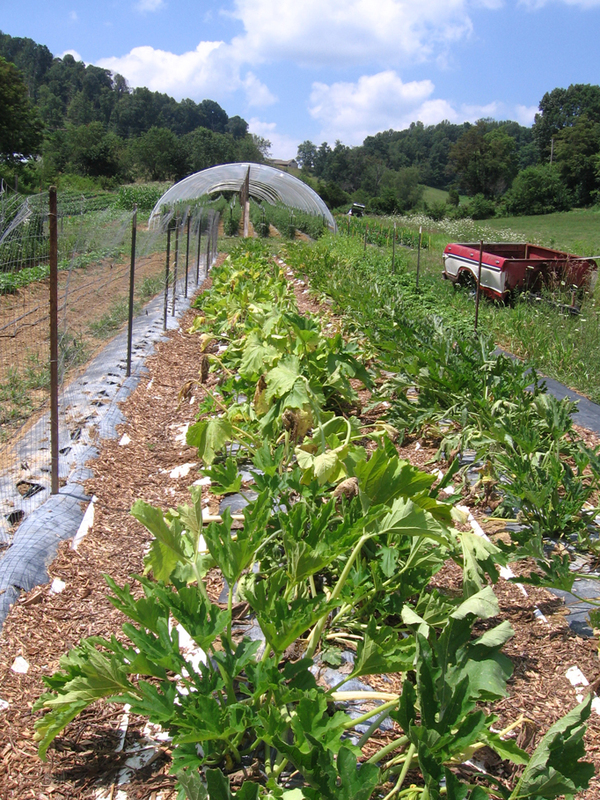 Our planting takes quite awhile, because we do it all by hand, scooting across the ground, pinching and dropping seeds. Someday, we’ll have more equipment. We hope to have enough produce to sell a bit this year. I am keeping my fingers crossed that John will get a chance to work on the barn so we can get a chicken flock that will be protected from predators, and eventually a few goats. I’d like to be able to sell eggs as well. John has mentioned wanting to spend more of his time on the homesteading, and for it to work as we have dreamed, that will have to be the case. Our friend Nathan has been helping us along, but he will be leaving on a year long, around the world trip in August. Another friend Brett Ratliff has been helping as well. He is a musician and travels quite a bit as John does, so his time exists a bit of everywhere. Both of them are bachelors with nothing tying them down – free spirits those boys, and huge helps as they can be. 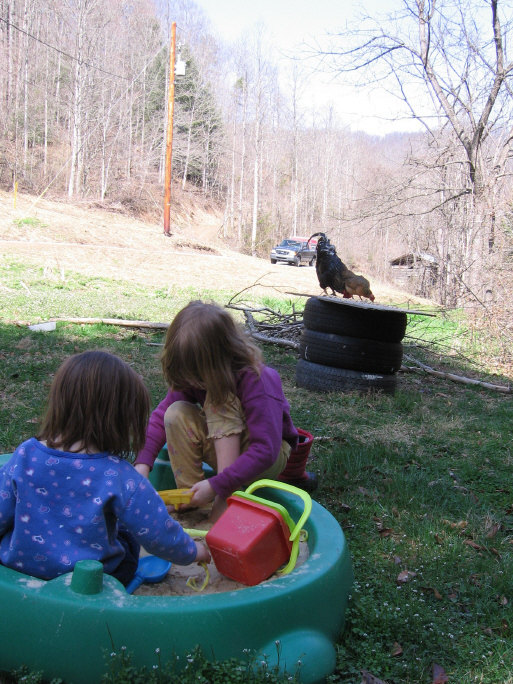 So, then there is me – mountain mama of two under five. 🙂 I can get a lot done, but not enough. If John is able to be here a bit more, then it will be a huge help for the homesteading dream. The Confluence in it’s current existence is our home and Nathan and Brett call the cabin at the mouth of the holler home. The four of us are working on this project together as our time allows. We are planning to bring it into a place where we offer workshops on sustainable agriculture and traditional music. John’s art studio is here, and he plans to open that to the public. We may host some small group events as we are approached to do so for traditional music, arts, sustainable living, natural family living, and childbirth preparation. Eventually, when Nathan comes back from traveling the world, we may apply for non-profit status. So, this year, we are slowly moving forward, and we are happy with that. John is so good for me in that regard. I’m like a wild filly out of the gate. I want to do everything in short order. But, we are moving just as fast as we are supposed to. Any faster would be overwhelming. 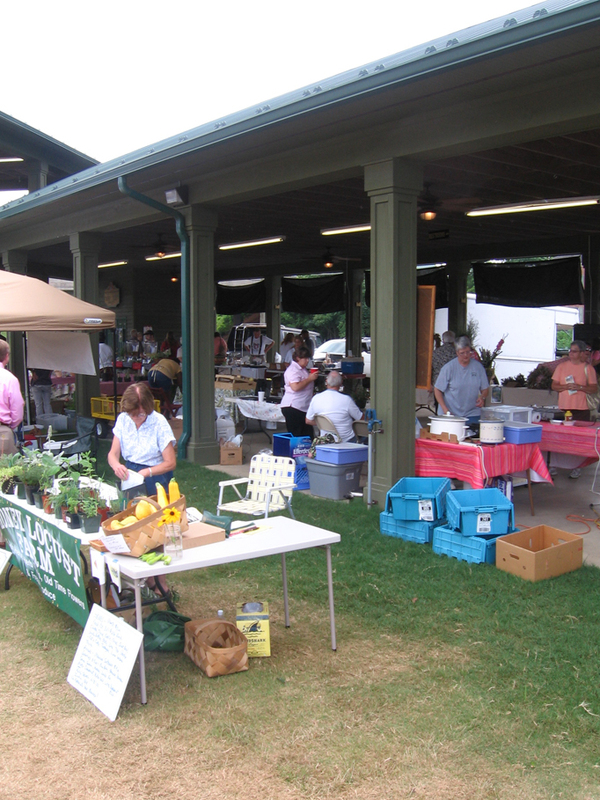 We have heard rumors of Farmer’s Markets organizing, so my goal is to participate in those as we can. I am prepared to do a lot of preserving food too. A gal has her first moon time and is initiated either gently or suddenly into womanhood. A woman experiences pregnancy and birth or feeling love for someone more than any love she has ever felt for herself or another – a different love – and she is initiated into motherhood. Today, I was initiated. I took another step out of the speeding rat race of the world back into the days when woman, wife, and mother were words for many other jobs as well. Yesterday was a blessed and sunny day. We spent the day outside, enjoying our chickens who have finally started laying and setting. 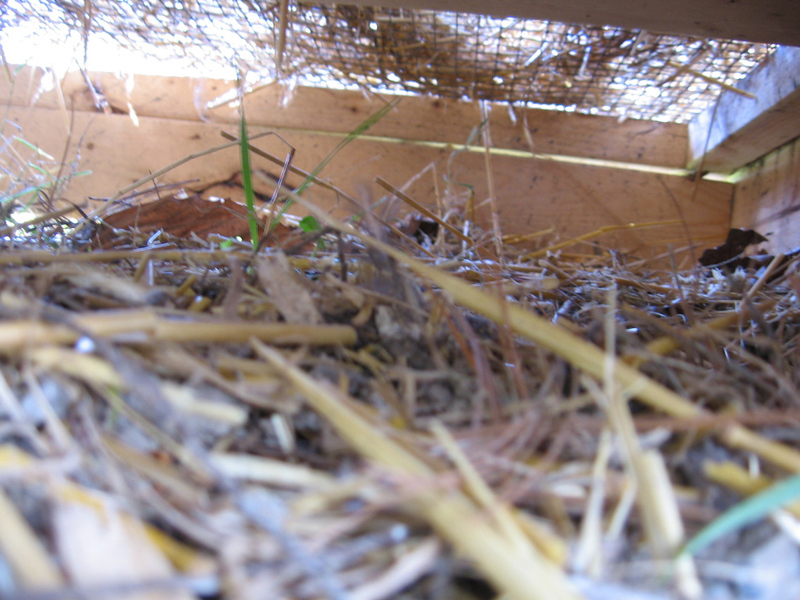 The house chickens have found a safe nest – their third try. The barn hens began using the nest boxes and sticking close to the barn. The other day we found six of Little Girlfriend’s eggs in Lars’s doghouse. She wasn’t setting, so we ate them. She moved the nest under the old coop. 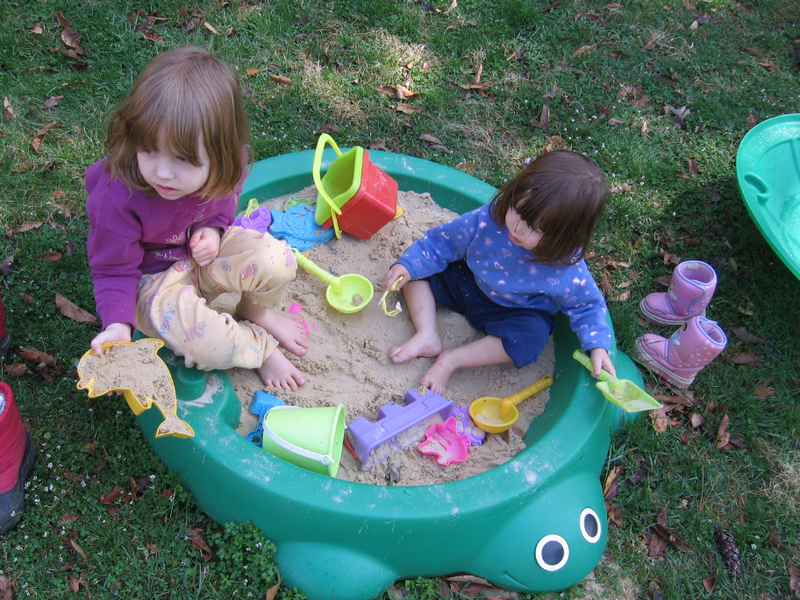 The girls played in the sandbox. I planned for a breastfeeding workshop I am giving soon, sitting next to them in a straight backed chair with my lap desk and the sun giving the perfect light. This morning it was gloomy. The rain clouds came overnight. John was preparing to leave for the weekend, and we had just finished our pancake breakfast. Our neighbor, Brett, walked up on the porch in time to finish the last of the pancakes. He wasn’t coming to eat though. 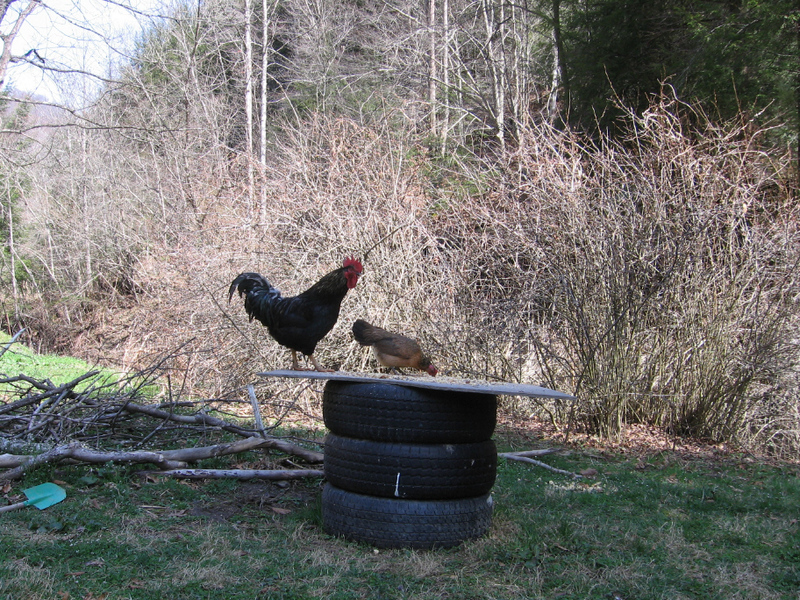 He was coming with photos of a hawk, down in the barn, killing our setting hen. Brett wasn’t able to stop it. We work really hard at getting things just so. It seems to go better, then the natural world reminds us where we are in the scheme of things. It didn’t take me long before I had a plastic grocery bag in hand and shoes on my feet to walk down to the barn. I got there and realized the hawk hadn’t broken her skin, only her neck. I picked her up by the feet, put her in the bag, and brought her up to the cabin to be prepared for eating. I used a Buck knife my daddy gave me to remove her head. She was our sweetest and prettiest hen. The knife wasn’t the type I needed, but the best I have. I tossed her bitty head, with cute tufts of beige feathers that stuck out from her cheeks, into the trees. I made a quick phone call to my dad for some reminders and instructions, and John and I took her to the creek to gut and pluck her. I remembered my great grandmother, Golda Johnson, and her deep fear of chicken feathers. I remembered the story of my Uncle Vince ringing a chicken’s neck, and its body flying off and into my great great grandmother’s well, ruining the water. I remembered my grandmother’s (Ida Hansel) disgust at a chicken and her druthers of not fixing it to eat. John stood by to observe, and I stuck the Buck knife into her soft belly slicing downward. The knife hit a shell. When I opened her, I pulled out a perfectly formed egg. The one she’d lay today. I set it to the side. With two fingers I began to remove her innards from the cavity of her still warm body. I understood for the first time how much of her little body was devoted to making eggs. To being a provider of life and food. I held her tiny, healthy heart in my hands a moment to look at its perfection. Plucking was harder. It took me a minute to get the hang of it. I finished her in the house, after a scald in the pot. Plucked, drained, gutted, and washed, I placed her in a freezer bag to be fixed when John comes home. I knew at some point we’d eat some of the animals we raise. Deladis took it well. She knows where her food comes from, and she likes meat. Ivy cried a little, but I think she sensed my downtrodden mood. I wasn’t ready to do it today. Not without numerous diddles running across the field following their mama. Not without a fridge full of eggs. I couldn’t let her go to waste. She wouldn’t leave her nest. She couldn’t run. In her death, she’s giving us a most healthy meal, and a perfect egg. Both will be prepared with love. We will consume her and know her. We will know personally our food. I think of the Appalachian women whose job it was to kill and prepare chickens. Appalachians mostly ate hogs, but on a Sunday, fried chicken was a nice dinner, especially if you were expecting company. I wondered at their chore of feeding the chickens, holding them under their arms, gathering their eggs, wringing their necks, plucking feathers, and preparing them into a special dinner with all the love they had to give. It was the least I could do for our hen. Later on, we stopped at McDonald’s after a prolonged doctor’s visit. From the drive-thru I saw a mama dog with heavy teats wagging her tail at every stranger that passed by, hoping for a bite. She hadn’t gotten anything, and she was begging so politely. Hungry to the core as only you can be when nursing a baby, and yet she begged with more humanity than some people I’ve encountered on the city streets. We got our food, eased the truck next to her, called her over, and the three of us females donated half of our meat portions to her and her pups, wherever she had them waiting. She ate without chewing, her front paws on my seat. I’ve been initiated. It’s hard to wash the smell of blood from your hands. I want to begin by apologizing for not quite keeping up here with the comments and posting these last few months. I want everyone to know I read every comment and respond in my mind (Hopefully, I will be able to do better about posting those thoughts as we get back into a healthy post holiday rhythm). I very much value the interaction on this blog and the others I read. It’s nice to have online community. But… the highlight of the trip for my personal self was a trip to Trader Joe’s to stock up on some hard to find grocery items. I had read various women sing the praises of Trader Joe’s on internet forums, and I had never experienced for myself. I have fallen in love, and I want to know how you can get a store like that to come to a rural place like this. The first surprise was the size. It was a tiny, quaint store. I didn’t know what to expect, and while I didn’t see shelves and coolers filled with a crazy variety of food like you would at a Whole Foods store, I saw just enough. It was almost perfect – almost. The prices were the kicker for me. I found Trader Joe’s bacon that was nitrate/nitrite/MSG free for $3.99. I bought 4 packs. Here you pay $4.99. Frozen blueberries for $2.99 (12 oz.). Gluten Free Mac-Cheese for $0.99 a box! I found whole milk yogurt with a higher fat content than Yo’ Baby, and when you have a picky toddler who loves yogurt that is a blessing. Ivy needs all the fat she can get. It was wonderful. I bought four large canvas bags full to the top of good food for $137.00 I can’t believe how excited I get over food. I want a Trader Joe’s in the mountains. I pay twice the price for some of the things I bought today on a regular basis. I think that once local people saw the food was affordable, they’d be happy to shop there. 2010 is a good year. Heck, every year is a good year. We are blessed with life! I have been inspired in these last weeks, and I know without a doubt that I am being led, and I am taken care of. It’s nice to be assured of that. It’s freedom. It makes you want to do something about it. Over on a blog I found a few months ago a challenge is being held – Hip Mountain Mama (One Small Change) . She is encouraging people to make small changes in our living to create sustainability and positively influence our impact on the environment. John and I try to work on this every day. It is of a great deal of importance to us as energy issues impact our everyday life with the coal industry being a crucial part of the economy of the mountains and living with the impact that has on our surroundings. We know that this isn’t a stable energy source, and it won’t be possible to fuel our local economy off of it forever, and John and I both believe we mountain folk need to start making those changes now and learn what we can do to sustain ourselves here. However, we know that coal provides about 80% of the nation’s electricity, so it is up to all of us to begin that change. I probably won’t be able to keep up with the blog deadlines she has set, but I’m going to participate in my own way. 1. There is no recycling center in our county. The closest is about 30 miles away. Because of this we have stopped recycling. (And John watched a Penn and Teller BS episode and feels it might not be so bad. I don’t know. I’d have to revisit that episode myself.) So, in lieu of that, I’d like to reduce our waste. We have it down to about 1 garbage bag a week. The next change I think I will make it making some napkins to use in place of paper towels for eating and some mess clean up. I have some old sheets that would work perfect for that. 2. I’m going to make it a point not to buy bottled water when I am out and about. I plan to purchase a stainless steel water bottle and fill that to carry around. We use water we collect from the watering hole for consumption and cooking at home. Carrying that with us won’t be hard. Plus, after hearing about the movie Tapped, I am motivated. It is hard to think about when the local water supply can hardly be trusted because of recent petroleum spills and other such industrial pollutants. Praise God for our watering hole. I challenge everyone to make one small change. Something you can feel good about. I’m wonderfully optimistic about the year to come. I think I’m finally coming to an understanding of what it means to let go and let God. To kick off the new year, I have decided to start a series of posts on things we have a right to know about (in fact in many situations our life depends on it), but for whatever reason they are kept “secret” whether through planned secrecy or by tactful exclusion of information. John and I spent the evening on the couch last night watching our new Netflix arrival – Food, Inc. . I’ve been waiting on this movie since it came out a while back. This film demystifies our current system of industrialized food and the problems that arise from our expectation of fast and cheap food. It was a little over a year ago now when a prolonged illness of mine prompted me to switch our diet to a traditional foods diet as proposed by The Weston A. Price Foundation and authors like Sally Fallon and Nina Planck. Since then, I have noticed a tremendous change in my health and well being along with that of my husband and children. I have lost and maintained a 100 pound weight loss (though I was already losing weight before changing my eating, I contribute most of it to traditional foods). I have more energy. My gums no longer bleed when I brush or floss my teeth. But, the most noticeable for me is my relationship to food. I no longer fear food making me fat, because I know that what I am choosing to eat is real food and not something fabricated in a factory. I enjoy my food and I eat plenty of it. I’m eating things the diet industry tells us will make us obese and sick – butter, bacon, red meat, and whole fat dairy. This approach to eating (I don’t call it a “diet” in the terms of how most of us view the word) has changed my life so completely that I can’t help but get excited about sharing it with others. However, all to often I have noticed people don’t want to hear the truth about where their food comes from, and I tend to get tuned out. Instead of accepting that there is a problem here and we are in need of huge change as a society, they continue to eat from the conventional store shelves food that more often than not is some kind of factory made variation of corn or soy bean products and they wonder why they are sick with things like diabetes, cancer, high blood pressure, heart disease, or obesity. Why is that? The fact of the matter is that we have a right to know where our food comes from and under what conditions it is being processed for our consumption. Our food is life. What we put into our body directly affects how we are able to live our life. However, now that our food supply is being controlled by just a few multi- million (billion) dollar corporations that treat their farmers and factory workers like second class human beings, who don’t care at all about the health of the animals they process for meat, and treat our meat, produce, and dry goods with a variety of chemicals to give them unnatural shelf lives, we are being kept in the dark of food practices that if they were public knowledge would incite the citizens of this country to demand a change. The truth is that 1 in 3 children in this country born after 2000 will develop diabetes. 1 in 3 children in this country are either considered overweight or obese. Low-income Americans (under $30,000) a year find it hard to afford a healthy diet. This comes along with the idea of fast food being cheap. You now can buy chips for a lesser price than a head of broccoli, and then there are dollar menus at fast food restaurants. The question of food availability also arises. Living in rural Appalachia, I find it extremely difficult to find food I feel is appropriate for my family, and I have to make too many compromises. Our country is facing an epidemic that is inexcusable. We owe our children a better chance at a healthy life than this. We owe it to ourselves as well. While industrialization has brought about many good changes in our way of life, when its principles are applied to certain more personal areas of our lives, we find we are detrimentally affected by its lack of concern for the greater human good as opposed to the low cost production industry holds so dear. A few profit from the loss of many. After viewing this film and others like it, I can’t help but encourage others to become informed as well. Know where your food comes from. Know that in one pack of ground beef there is meat from 50-100 cattle. Know that most chickens raised for commercial slaughter for companies like Tyson never see the light of day or feel grass under their feet. In fact, they are lucky to be able to bear their own body weight on their brittle legs. Know that the tomato you are buying that is so pretty and red was shipped to your location in many cases over thousands of miles, and picked while still green. It was ripened chemically. Know this, and decide to change it. There are farmers out there with answers to this problem. We can have normal, affordable, healthy food. We can live without the fear of food related disease. Arm yourself with knowledge. Then, cast your vote for the foods you want every time you choose your purchases at the grocery. It takes us awhile to recover from Christmas. In two days, we have Christmas festivities with four families. This week we are traveling to South Carolina (where I am writing this) and later to Cincinnati to see more family. The two days we’ve gotten to spend at home have been spent in rest and trying to find places for the new toys. We gave a box of toys the week before Christmas to my nephew to help us with that task. I have never been an organizer of things. I organize myself and I have places for things that I care about in my home, but when it comes to having things look neat and tidy – I fail miserably. Our house is clean where it counts. The toilet, bathtub, dishes washed, and clothes washed, but neat and tidy it is most definitely not. I have tried before. I was fairly successful, but with so little room it has been hard to really make a difference. Not being gifted with the talent of housekeeping has made it hard to maintain. John recently told me to let go of the standard I am trying to achieve. In ten years of marriage, we’ve not had a neat home, even before kids. It’s true. Clean, but not neat. With our various collections and our love for the written word, music, and art, comes a lot of things to be kept in our small cabin. I am not doing a good job of managing it all. Then, I am trying to find an organization that will work with me and my pursuit of becoming a certified childbirth educator. There are none here to train under or observe. Most organizations have at least that requirement. Travel isn’t possible for me without making huge,expensive arrangements. I also have to keep in mind the reputation of the certifying organization and the experience of others. It is proving difficult, but I’m pushing onward. I hope that by the time I finish my prenatal yoga training in April, that I can start offering my services to the women in our area. There is a lot of organizing to do. We have been taking time off of our homeschooling. I have been in deep spiritual study, and I am missing my yoga quite a bit. I love seeing family and spending time in places away from home, but not being able to do my daily yoga is hard. It is at those times when you can really tell what such a practice does for you. I hope to be able to post more starting next week. In the meantime, if anyone has any suggestions on home organization or childbirth educator certification for such a rural mama, I’d love to read them. Please comment. I’m wishing you all a great New Year and some restful fun! There are those times in all of our lives when it seems like things fall apart one after the other. The Haywoods are experiencing that right now. I wanted to come on today and post something cheery or at the very least poignant. Not possible. I write it as it is – moment by moment and right now it just isn’t flowers and fluffy clouds. We are all fighting colds. John actually stayed home from teaching music today. That is something he wouldn’t do without a good reason, not even if I think he has a good reason. He is sick. We are all exhausted. Then, yesterday, our refrigerator decides to give out. It took us awhile to notice and by that time we lost a lot of what I had stored in our freezer. 😦 I had stuff that I had stocked up on from our trip to Lexington and Whole Foods some months back. What saddened me the most are the blackberries that I had picked all summer and hoped to turn into blackberry dumplings had completely thawed and were dripping all over the freezer. The gas company took all my blackberries out with the new road. I was waiting for a special day to celebrate those wild blackberries. I quickly hopped online and posted to my favorite traditional foods forum and soon got a response to make a berry compote. I had flour soaking for pancakes this morning, so that is what I did. 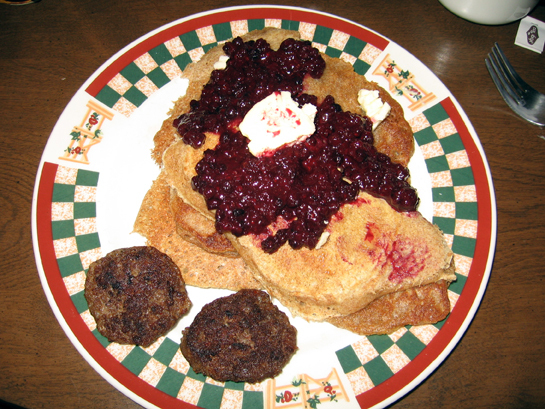 Berry compote is good on pancakes. I had never made it before or had it that I can recall, so I referenced an online recipe and made it my own. Put everything in a warm skillet and cook down until you have about half the liquid you had in the pan after the initial heating. Refrigerate and enjoy over ice cream, pancakes, or yogurt. We ate it this morning and it was delicious. I’m sure it did us good with all those antioxidants. Instead of spending this day to rest, John went out to find a decent used refrigerator. We scored one for $200, and he got it inside after having to take the back door off of the hinges. I feel sorry for him. It’s a two door. I’ve never had one of those before. This isn’t a good time for us to spend extra money either, but it happens I guess. I’m praying. I’m having some discipline issues too with Deladis. Four is proving to be the hardest age yet for me and my mothering. Discipline is something I have never been good at with young children. Having impatience as your big dragon doesn’t help much either. I’m sifting through that with tears. Someone really cool once said… “There is always a calm before the storm.” It’s storming now, so that tells me a calm is coming soon. I’m looking for even the smallest patch of blue sky.